How did it get to September so quickly? Really the 1st of September? Oh my gosh it's as if it's time that's travelling and so much faster than when I was younger!!!! 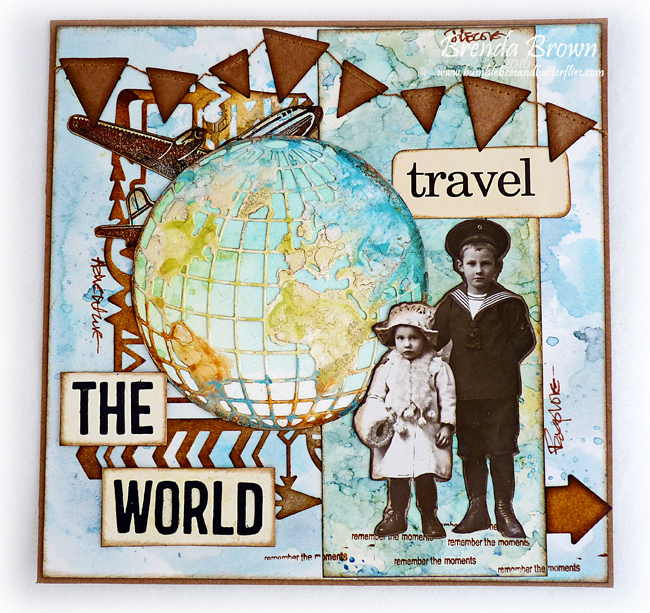 But anyway here is my DT project for the new challenge at Country View Challenges which is all about 'Travel'. This is a large 8 x 8 card and you can see I'm in light colours mode even though I have vintaged it with the browns and kraft paper. 1. Swipe salty ocean, stormy sky and weathered wood distress inks on your craft mat and dip the card in several times drying between each dip. 2. 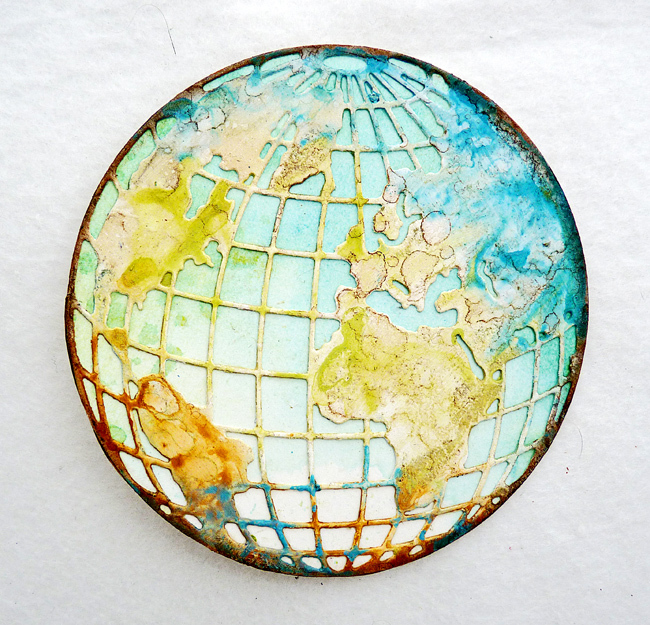 Take the Tim Holtz thinlits globe die, cut it from card and dip it into broken china, tea dye and shabby shutters distress paints that have been swiped on your craft mat and spritzed with water. Heat dry. 3. 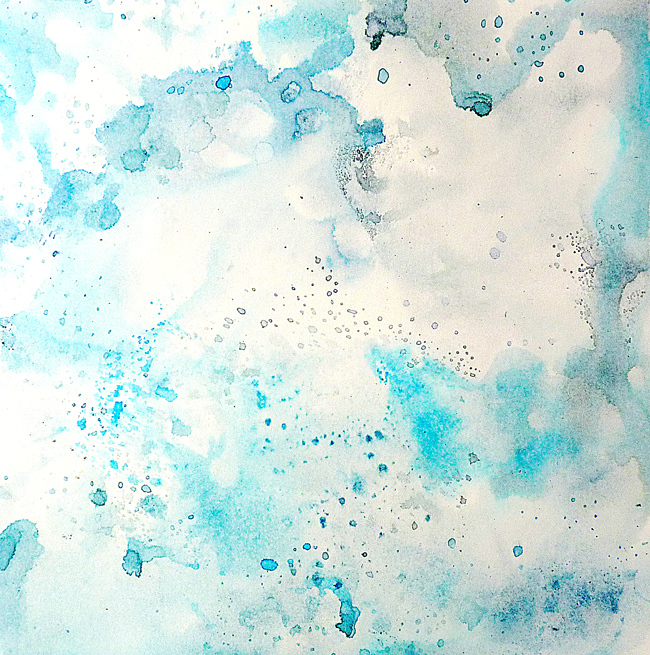 Blend stormy sky and antique linen over and flick with water and dry. The dip in a little watery ground espresso and dry to create the mottled effects. 4. 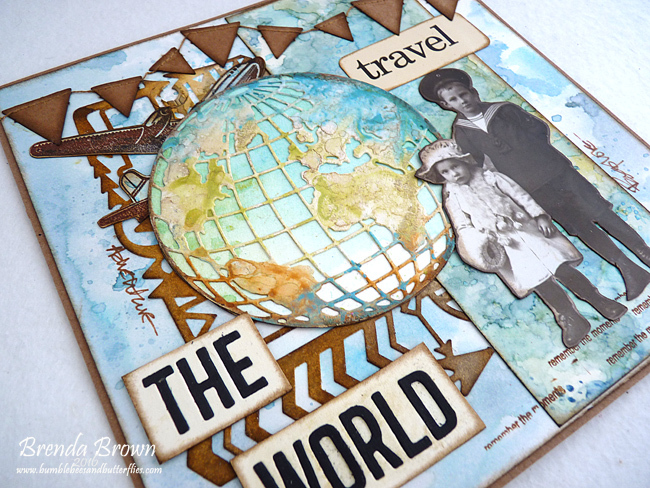 Create a backing for it using more distress inks and cut and glue together. 5. Take a piece of card and use faded jeans, forest moss and a very small touch of fossilized amber distress inks with the dip and dry technique, creating lots of inky layers and use as a panel. 6. 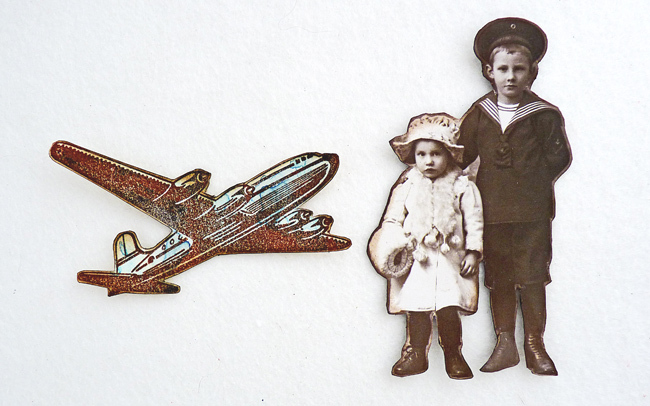 Stamp and cut Tim's aeroplane dip into stormy sky, weathered wood and salty ocean distress inks and cut out. Also cut round the found relatives photo and ink the edges of both using a brown distress ink. 7. Take a background die, I used Sizzix card front arrows and a mop up tag and inked the edges. 8. 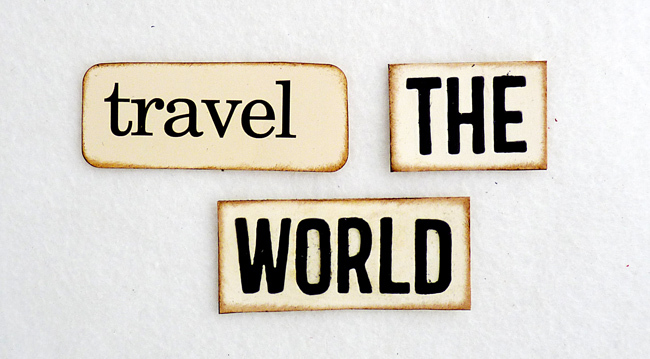 The travel word is an elementary flash card and the world made from Tim's adventure block works dies. 9. Put the card together adding any other embellishments that help to balance the collage and composition. I hope you will be able to join us whilst thinking about your Summer travels perhaps and of course if you join in you stand a chance of winning that £20 voucher from Susan at CVC. Thanks for stopping by here at Bumblebees and Butterflies - I hope you have time to pop over and see what the rest of the team have been creating too. wow, Brenda, your card is so beautiful! 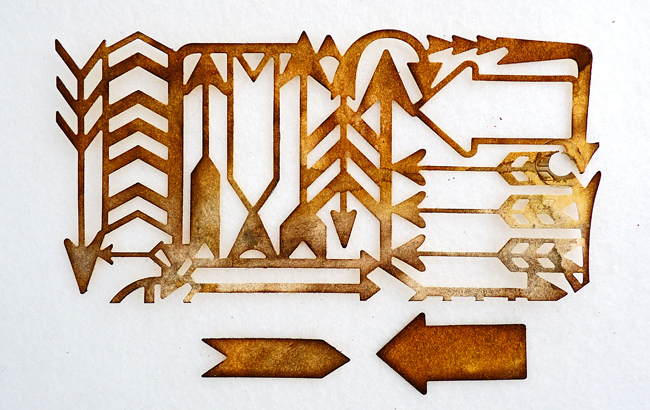 Love all these distress inked layers and the little flags make your composition complete. Beautiful card Brenda! 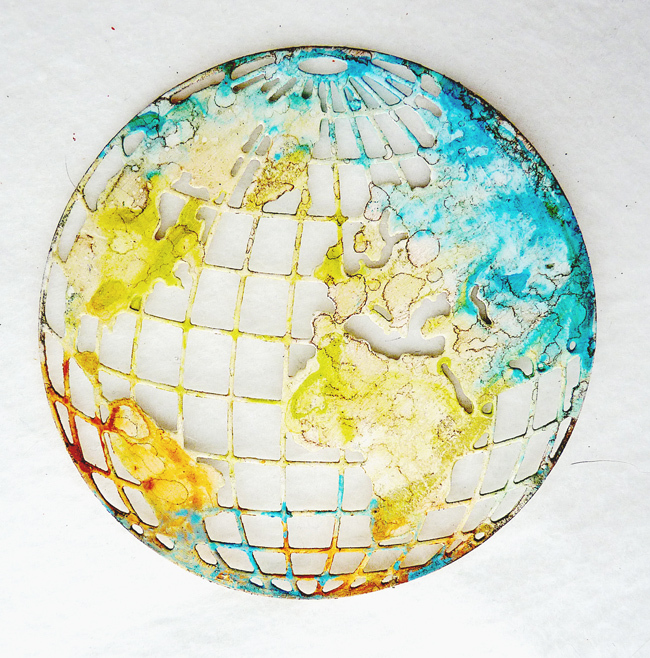 From the Distress ink background to the embellishments... Love how you created the globe, great techniques to give a realistic impression of earth. Wow, this is amazing. Love your wonderful card and all the details. Beautiful! The backgrounds are so lovely with the inky splattering and then the eye is drawn to the dark images and words on the card. Lovely composition and design. A fabulous vintage card Brenda, love the blues of the background and all those super details. A beautiful card Brenda, love all the inky layers in the backgrounds and all the wonderful details. That found relatives card is perfect for this! LOVE the colors and all the elements! Fabulous! Love this card, Brenda! The mix of inks is beautiful. 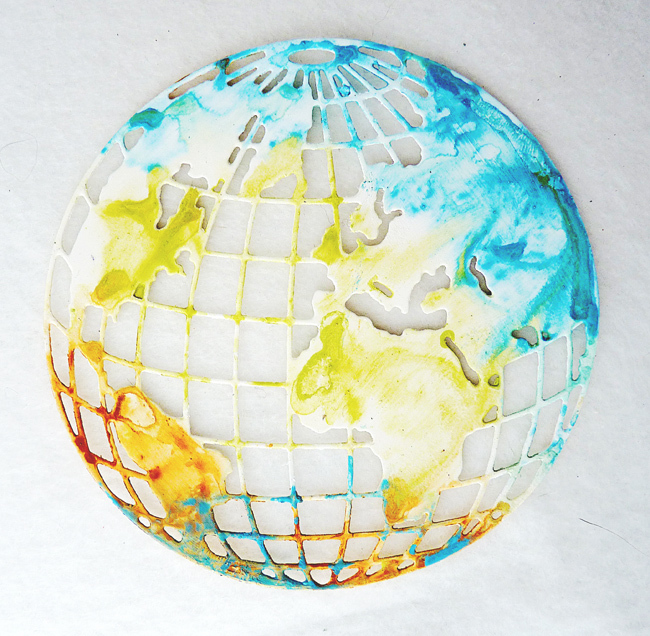 Love the globe and the sweet image of the children. Beautiful as always Brenda ! Scrumptious - love how the paler areas seem to glow with light, contrasting beautifully with the earthy kraft elements - a treat of a card.